Green Manure is a crop sown purely for the purpose of digging it in while it is still fresh and green to increase the fertility of the soil. They are generally under-used, yet they are cheap, easy to use and have a number of benefits. They are ideal whenever a patch of land will be free of crops for six weeks or more, and they are particularly useful to vegetable gardeners and allotment holders as part of a rotation system. 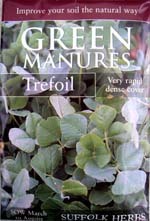 Although many green manures can be sown all year round, they are ideal when sown in the autumn to over winter, when vegetable plots are generally empty. Some green manure plants (legumes) are nitrogen fixers with ability to absorb nitrogen from the air, which is transferred to the roots and released when dug into the soil, giving a boost to the vegetables that follow. 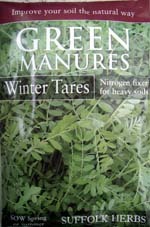 Growing a green manure in winter helps to retain the soluble plant foods which were present when the crop was sown, being easily washed away by rain or snow. 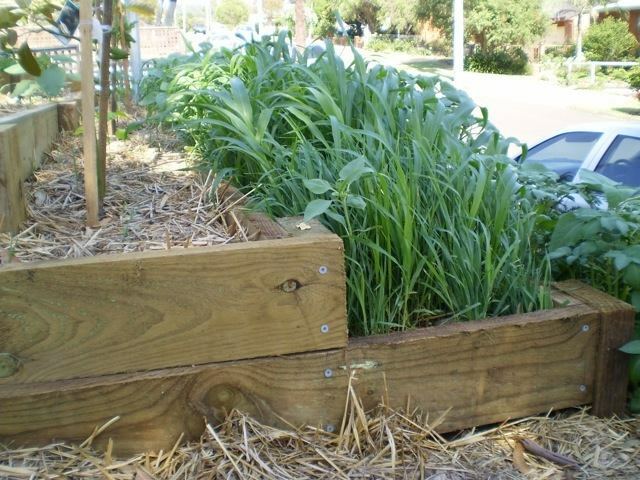 Bare soil encourages weed growth, so green manure bare ground to keep weeds down were it will smother seedlings and compete for light and plant foods. 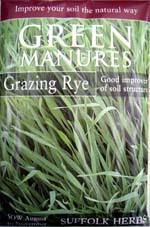 Green manure crops used in rotation with other crops help reduce plant diseases and insects in the garden. It can act as living mulch helping to control pests - provide safe cover for beetles, frogs and other predators. Protects creatures in the soil from the extremes of weather. 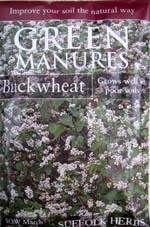 Most green manure crops are very attractive to wildlife. Clover is a green manure that can be left to grow for a year - when it flowers it attracts bees and other pollinating insects. Any plant can be grown as a green manure although some are much better than others and are available as seed especially for the purpose. They are not harvested for food, and for most crops, it is usually recommended that they are cut and used before they flower. It is better not to leave your crop in the ground for too long, as if plants get too old, then they can become tough and will take longer to decompose and be incorporated into the soil by soil organisms. 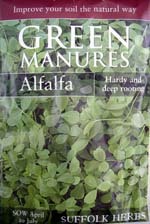 Green manure crops are a good substitute for farmyard manure which the gardener can incorporate quite easily. Prepare the soil by removing weeds, digging over if it hasn't been recently cultivated and raking level. Scatter seeds over the surface of the soil at around 50g of seed per square metre or following supplier’s recommendations for specific crops. Make sure the seed is in firm contact with the soil by gently tapping over the surface with the back of a spade. Water in well. Bare patches should be covered within two to three weeks and plants will give the biggest benefit if they are left for around eight weeks before digging. 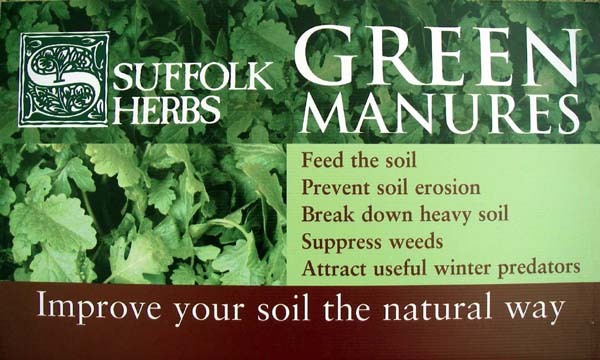 Ideally, green manures should be incorporated throughout the top 15-20 cm of soil where most rooting of the following crop will occur. This is also the place where decomposing organisms are most active. If plants start to flower before this, cut off the tops and dig in. 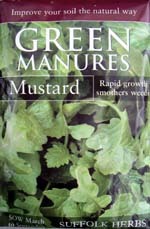 Leave the green manure to decompose in the soil for up to four weeks before growing vegetables. A little extra nitrogen fertiliser will help micro-organisms in the soil break down plant material into humus. Alternatively, if you do not to dig them in, then you can compost it or use as a mulching material instead. Composting is a good way of using up any crops which have been allowed to get too old and tough! Legumes develop on their roots (in association with special bacteria) nodules that have the ability to take nitrogen from the air and convert (fix) it into a form that the plant can use. This can then be utilised by crops grown after the legume has been ploughed and incorporated into the soil. Non-legumes do not fix nitrogen, but can provide useful amounts of organic matter and retain nutrients that might otherwise be leached. Some non-legume green manures are very quick growing and can be incorporated within gaps in production during the growing season. After you lift potatoes. planting agricultural mustard will help to reduce eelworm by hardening their cysts and preventing them from emerging on time, confusing their breeding cycle. Be careful though if you have club root because mustard is a brassica and mustard green manure can further spread the disease. 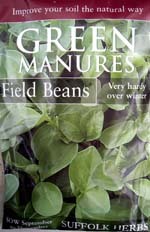 The second is a plant not normally considered as a green manure, French beans. They grow quickly and being legumes they fix nitrogen. 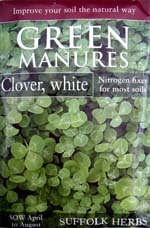 The seeds are large enough to handle easily and cheap enough to use as a green manure. Whenever you have cleared a crop and will have some vacant soil for a few weeks, densely sow some French beans. If plans go wrong and the space isn't required you can harvest the beans. Rather than digging the French beans in, you can just use them as a valuable compost material if you prefer.